As staffers at the Capital Gazette newspaper grieved the loss of five colleagues Thursday, they remained determined to finish Friday’s newspaper. 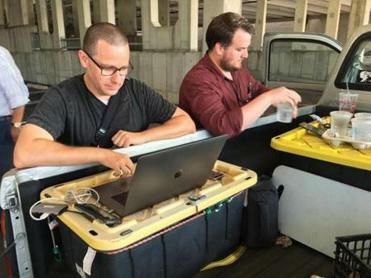 Meeting at a parking deck not far from their newsroom, the journalists put together the next edition, many still waiting to hear whether their colleagues were okay. The Friday edition of the Capital Gazette has a front-page story telling the story behind the tragedy that left four journalists and one sales assistant dead. Two others were also injured. The Capital Gazette front page on June 29, 2018. The grieving and the reporting sort of jumbled together for staffers at The Capital Gazette on Thursday night, but they were determined to put out the next day’s edition. “This page is intentionally left blank today to commemorate victims of Thursday’s shootings at our office,” the staff wrote. Material from the Associated Press was used in this report. Felicia Gans can be reached at felicia.gans@globe.com. Follow her on Twitter @FeliciaGans.